I guess I’ve finally gotten around to cooking from November magazines. This quick bread was in the November issue of Living, and the title alone made me want to bake it. Cranberry and cornmeal sounded like a great combination. Then, I read on into the recipe. I admit to having several food issues with ingredients that I usually avoid. One of those many issues is with crystallized ginger. I don’t even know why. I like ginger in both sweet and savory applications, and nibbling on crystallized ginger is perfectly fine. For some reason though, when baked goods include chopped crystallized ginger, I often omit it. Well, I decided to get over it and just go with the original intent of this recipe. At last, my mind might have been changed forever about this ingredient. The little bits of chewy, gingery goodness throughout the loaf were lovely in the cornmeal crumb. A sauce was made from cranberries, melted butter, and sugar. That mixture was cooked until the cranberries started to pop, and at that point, the sauce had thickened. Fresh cranberries were suggested, but I used frozen, and they worked perfectly fine. 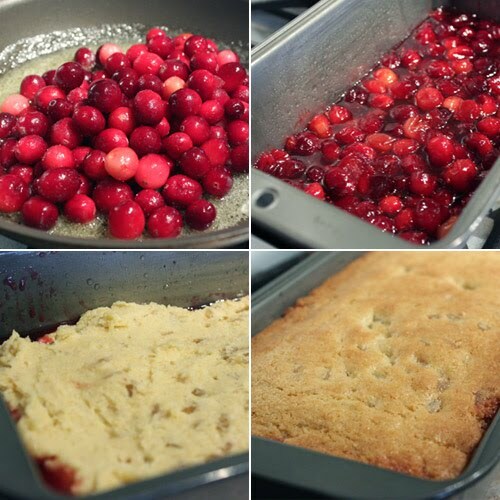 I also added a few extra cranberries just because I love their tart flavor. The cranberries and sauce were transferred to a loaf pan and left to cool. The batter was made from butter, sugar, eggs, and a whisked together mixture of flour, cornmeal, baking powder, baking soda, and salt. Then, the chopped crystallized ginger was folded into the batter. Something that worked well for me was to toss the chopped crystallized ginger with a small amount of flour. That way, the pieces didn’t stick all together in one clump in the middle of the batter. The thick batter with well-distributed chopped crystallized ginger was spooned over the cranberries and carefully smoothed. The loaf baked for about 35 minutes. My only complaint is that my quick bread didn’t rise to the nice, tall height seen in the magazine photo. I’m not sure why it didn’t since I used the same size pan and same quantities of ingredients in the batter. My baking powder is brand new too. Other than that minor quibble, I was very pleased with this. The cooled loaf was turned out to allow the cranberries to sit on top like jewels. It was sweet and tart and the cornmeal and crystallized ginger flavors worked together very well. And, just like that, I might be over my crystallized ginger thing. Yummy, cranberry breads are a real favorite. Gorgeous display! Yum...this looks so good. Cranberries are great any time of the year! Oh, it looks wonderfully moist and delicious! I bet that a drizzle of condensed milk poured over that slice would be terrific! My favorite scones are these cranberry cornmeal scones that are sold in the farmer's market in Union Sq (NYC) so since then I've been partial to the combination. I like ginger too and always love the ease of quickbreads so looks like a winner! It still looks good! Looks super moist! This would be perfect for breakfast or dessert. Heck it'd be great for lunch and dinner. Fantastic, Lisa!! 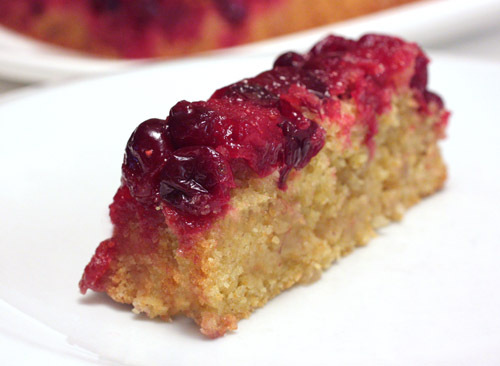 This cornmeal bread sounds wonderful with cranberries and crystallized ginger! I love the colour of this cornmeal quick bread. Sounds good to have cranberries with the quickbread, yours is very moist! Oh wow, the perfect winter dessert! I still have yet to cook from my magazines from the fall! Haha! Gorgeous bread! The cranberry slices look so gorgeous! Moist, rich and loaded with flavours! oh yum and then yum again. the berries look lovely but it's mainly the bread itself, it just looks so moist and succulent. Ooh! Jewels on cornbread. I like that! 5-Star Foodie is having a cornbread makeover round-up...you should let her know about this! Leave it to you to make simple cornbread look absolutely divine. I don't know how you do it all the time. This is simply beautiful! I never really use crystalized ginger either. My parents used to put it on some cheese when we had guests years ago and that is how I know it... :) But it sounds like you found the perfect use for that type of ginger. It looks delicious! I still have cranberries in the freezer!!! I was hesitant over using crystalized ginger too - and then one day I just went for it and loved the results. This looks wonderful with those vibrant cranberries over top. The crystalized ginger and cranberry jewels embellish this quick bread beautifully. Great photos! All you had to say was that there was crystallized ginger in this! I'm so there! Plus, I just happen to still have a bag of cranberries in my freezer, too. Perfect timing. Ah! A cranberry upside down cake! Perhaps it didn't rise the way it was supposed to, but it looks moist and delicious! We love anything with cranberries around here. My market still had them last week-fresh. That looks like a perfect dessert. the cranberry jam on top makes your bread look really pretty. so gorgeous! i have 2 bags of cranberries, waiting for inspiration. it has arrived! thank u! I would eat bread like this everyday Lisa. So delicious and pretty looking! Gorgeousness... I do miss the fact that we don't get fresh cranberries here. What a super delish bread. That cranberry bread looks really good! I love ginger in every form,..Love it chrystallised too! I do think that your bread looks good though! I love the color of this bread! Lisa, I think the low rise (sounds like I'm talking about jeans ..) issue has to do with the recipe not being specific enough about the cornmeal. Having followed your blog, I totally ruled out the newbie baker possibility. I'm sure the original recipe, or at least the one used in the photo shoot, used fine semolina instead of regular cornmeal. There are so many types, from stone-ground to really, really fine semolina. One cup of stone-ground cornmeal and one cup of fine cornmeal will create a HUGE difference in the texture of the end product. Wow, that looks amazing. I still have a ton of leftover cranberry sauce in the freezer, do you think I could get away with using that instead of actual berries? Yum, love this idea. I can imagine how tasty and toothsome this recipe is. Love the addition of cranberries. As to it not rising enough, you were probably the only one who noticed. I love and hate that fact. Gorgeous Lisa! I'm glad you were able to get over your candied ginger aversion. So here is one of mine - I don't like cranberries in things! But this looks terrific. 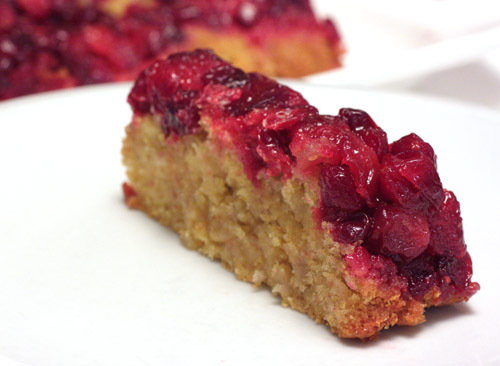 What a unique cornbread - I love the cranberry topping! Ooh lisa, we both have cranberries on the brain! Good thing I bought extras! Not a crystallized ginger fan? Shame! It's so fun to work with. You've found a way now.